Event details for overnight ghost hunts, ghost nights and ghost hunting experiences that Ghost Hunt Events have planned for Kent, Sussex, Essex, Devon, Dorset, Hampshire, Cambridgeshire, Oxfordshire, London, Somerset & Suffolk. Tickets from; £35 per person. Slough Fort, Allhallows, Kent is a small artillery fort that was built in the north of the Hoo Peninsula in Kent. Constructed in 1867, the D-shaped fort was intended to guard a vulnerable stretch of the River Thames against possible enemy landings during a period of tension with France. Its seven casemates initially accommodated rifled breech loading guns, which were replaced by the turn of the century by more powerful breech-loaders on disappearing carriages, mounted in concrete wing batteries on either side of the fort. It was likely one of the smallest of the forts constructed as a result of the 1860s invasion scare. 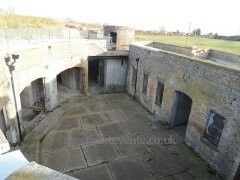 All of the guns were removed by 1912, though the fort continued in use during the First World War as a command post. It was decommissioned in 1920 and sold off in 1929 and converted into a small zoo. Before the Second World War; it was used as an observation post from 1938, became part of the local anti-invasion system in 1939-40 and was used as part of the air defence network against V-1 flying bombs in 1944. There was partial restoration in 2012-13 that uncovered previously buried features of the fort. Whilst on our site visit a strange presence was felt in the Brig (cells) area of the fort, as well as previous visitors hearing a girl laughing in the right wing battery part of the Fort. 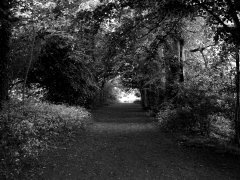 Vinters Valley Nature Reserve in Maidstone, Kent has had a very intersting history and a house has stood on this land for 600 years. Roman remains have been found on the site in the past, but the first recorded history was when a Roger de Vinter bought the land from the Abbott of Boxley in 1343, and built the first house. In 1554 Henry Isley, took part in the Sir Thomas Wyatt the Younger's Rebellion and was executed for his trouble. His property was seized by Queen Mary I (Bloody Mary) who bequeathed it to a Henry Cutts of Bynbury. Vinters house was bought by a local businessman, James Whatman of Vinters. Although he didn't ever live in Vinters his son did. James Whatman of Vinters moved into the house in 1782, having bought it some time previously from the then Lord Ongley. He died in 1798 aged 57, and like many Whatmans was buried at Boxley Church. During the Second World War the house was taken over for Military purposes and many Army units passed through the park. The fine furniture and effects were locked away. The ATS girls stayed in the house, with the men in billets near the kitchen garden. Having been empty for a few years the entire estate comprising of 660 acres was sold to a property developer in 1956. Shortly after this the house burnt down, and was demolished.